I just got back from a great week in Key West where I helped with some filming for a new Sportsman Channel show. We were really thrilled to have Beavertail Skiff's owner Mark Fisher and his good buddy Matt Kersting along for the trip. This was also the Key West debut of Mark's latest design, the all new Vengeance skiff. The wind was honking at 15 to 20 knots all week but we managed to land some great fish on the flats and rack up some really impressive bar tabs at the Hurricane Hole Marina. The Vengeance on its way to Key West. This boat is hands down the most amazing skiff currently on the market. Over the past 20 years I've been on just about every flats boat on the market and have owned five different models, including a top of the line Maverick. None of them run through chop as smoothly and keep the passengers as dry as the Vengeance. It's also as easy to pole as the lightest, but far more expensive, Hell's Bay models. Angler Matt Kersting staying dry on a high speed run to Calda Bank on the new Vengeance. Watching our camera crew running ahead of us in their Maverick skiff. They nearly drowned in the southeast chop. Matt and Mark with a beautiful 15 pound permit caught on a live blue crab. Our Beavertail BTX camera boat owned by Capt. Rob Kramarz running director Brad Douglas and cameraman Don "One Sock" Hoy towards Bluefish Channel. Capt. Rob is a great guide and it was a blast hanging out with him all week in Key West. Matt Kersting casting some of his excellent flies in the insanely difficult Key West wind at some crusing permit. Myself and Mark Fisher with his 12 pound permit caught off Boca Grande Key. Mark paid his dues by sticking several flies into his skull before lowering himself to catching this permit on a live crab for our cameras. This show's editing department is going to have a hell of a job with their bleep button for this segment. Matt and Mark with one of the two dozen tarpon we hooked Tuesday night under the Cow Key Channel bridge. This was probably three of the best hours I've ever spent on the water. The tarpon were hitting every other cast we threw under the bridge and a trio of homeless drunks were hurling abuse at us from the shore. Between hookups we were emptying a cooler full of Sam Adams and I don't remember laughing so hard in a long time. It was one of those rare moments in my life where I had to stop and ask myself, "Should I really be having this much fun?" This whole trip wouldn't have been possible without the invaluable help and advice from my good friend Capt. Mike Bartlett, pictured here on high alert for catchable fish after a night at my buddy Irish Kevin's house. In all seriousness, here's the image of Mike that most people will see after they book him for a charter. 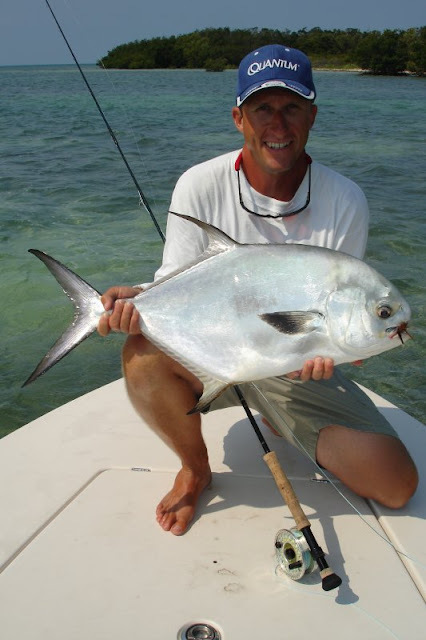 Mike Bartlett is the best permit fisherman in Key West and is also the first captain to guide an angler to a Grand Slam in the Keys in 2010, something he did the day before we arrived with our cameras. For some reason Mike likes to claim that I was his mentor before he started guiding in Key West. That's a ridiculous statement since he has easily forgotten more about flats fishing in the Keys over the past decade than I've ever known. If you're heading to the island do yourself a favor and book this guy right now. Key West is an amazing place where I was lucky enough to spend one third of my life. I've been away from it for too long and this past week was blend of everything I always savored about the island, especially the fishing and the friendships. I can't wait to go back there next month.